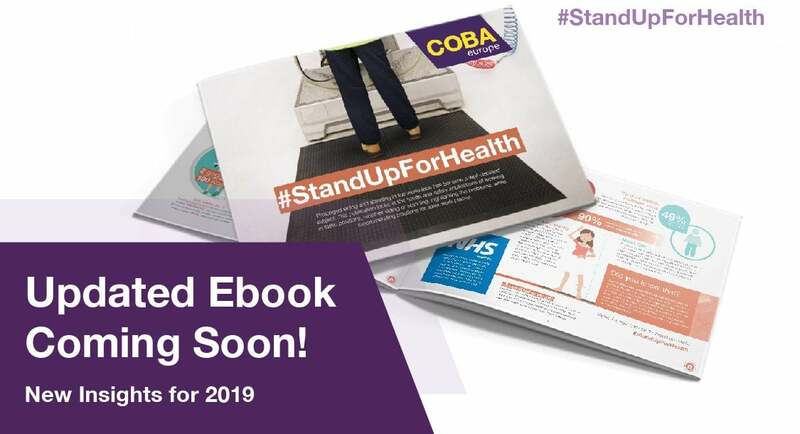 Our eBook #StandUpForHealth is one of the most popular downloads from our COBA Europe website. From this, we can presume that more and more companies are recognising the importance of safe and comfortable standing (as well as sitting) in the workplace to reduce the risks to employees of both upper and lower limb musculoskeletal disorders (MSDs). Back pain accounted for 85% of health conditions as a result of standing at work, with 50% of respondents saying they (or colleagues) had suffered from Varicose Veins and 47% having sore feet as a result of their occupation. 45% of respondents identified people taking sick leave as direct result of standing at work. 65% considered sick leave to have an impact on productivity within their organisation. Of those who invested in anti-fatigue matting as a solution, 68% considered this to have had a positive effect on the wellbeing of staff. 86% found anti-fatigue matting helped to reduce pain or serious health conditions. Work-related MSDs continue to be a prevalent problem in the UK workplace as recent 2018 HSE statistics will testify. According to HSE statistics, “MSDs represented 24% of all days lost to work-related ill-health in Great Britain in 2017-2018”. This equates to some 6.6 million working days lost – that’s a lot of personal suffering for the individuals concerned, and a lot of lost productivity for employers. The scale of the problem is one of the reasons why we, at COBA, continue to actively promote awareness and encourage all employers to adopt a ‘preventative’ culture in their workplace, alongside ‘wellbeing’ initiatives. Regular risk assessments are essential. As an example, this may involve a structured ‘Sitting and Standing Policy’ covering regular breaks and rotation in sitting/standing tasks, or stipulating maximum standing times in conjunction with a well-designed, ergonomically friendly workspace. Additional ‘MSD-preventative’ measures include the use of anti-fatigue mats as anti-fatigue matting, through its cushioned surface, can be beneficial to those who regularly stand during their working day. While we used to associate anti-fatigue mats more with factory workers standing at production lines, other professions such as retail, hospitality and even office workers using standing desks, can also benefit from the right anti-fatigue mat to make standing more comfortable – and kinder to limbs and joints. To understand exactly how anti-fatigue mats can help, the article we published on The Science of Standing can be helpful …. #StandUpForHealth was first published by COBA Europe in 2016 and the information has proved to be a valuable resource for a wide variety of companies, from small to medium sized enterprises to large multi-national names. Preventing the occurrence of MSDs in the first place is much easier than cure. The updated release of our free to download eBook containing all the latest ‘standing safety’ news and statistics, along with some expert opinions is now available for free download.